Most of my Christmas memories revolve around cookies. My sister and I began at an early age to help our mother bake these annual treats because Mom liked to cook, not bake. But to Mom, Christmas required cookies, and her favorite eggnog butter cookies were a big recipe that called for a lot of decorating with bits of sparkle and color to make them just right. My mother was very big on making things just right. Now, I bake these eggnog cookies every year and cajole my kids to help decorate. 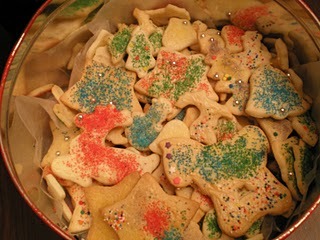 Imagine my surprise to find many of my girls’ friends did not have homemade cookies for the holidays! Baking from scratch seems to be going out of style because everyone is too busy or on a diet. What is the world coming to! If the wise men had been women they would have brought cookies to baby Jesus. 1. Use light-colored edgeless baking sheets. temp mix in with that better. 4. Use real vanilla. Use real butter. Use fresh spices. Always. and they’ll end up too crunchy. remove or they will continue to cook. of plastic wrap under the lid. Nobody likes dried out cookies. smells and flavors meld together. *If you do happen to overbake, immediately remove cookies (parchment sheet and all) onto a cooling rack. The most important tip? Have fun! This entry was posted in recipe, traditions and tagged Christmas. Bookmark the permalink. Nice post Linda! I tweeted it.